Two different configurations for the FID Tower Plus are available – the high purity PG Plus and the ultra-high purity NM Plus – with flow ranges up to 1 L/min for H2 and 5L/min for zero air. The optional Zero Air generator provides zero air with HC content around 0.5ppm. Deionized water is automatically loaded from smart internal system tanks with a 3 liter capacity, providing up to 3000 liters of H2 before a refill is required. The only recommended maintenance is the replacement of the internal deionizing cartridge, which is an easy, simplified process. The deionizer bag can be changed without tools or even turning off the instrument. The very limited internal volume of the FID Tower Plus (less than 50 ml) allows for the safe use of the unit where the use of cylinders is risky or prohibited. The application of featured and tested safety technologies automatically halts operation of the unit in the event of a leak or malfunction. An optional hydrogen sensor is available for monitoring the oven-LEL of the GC. 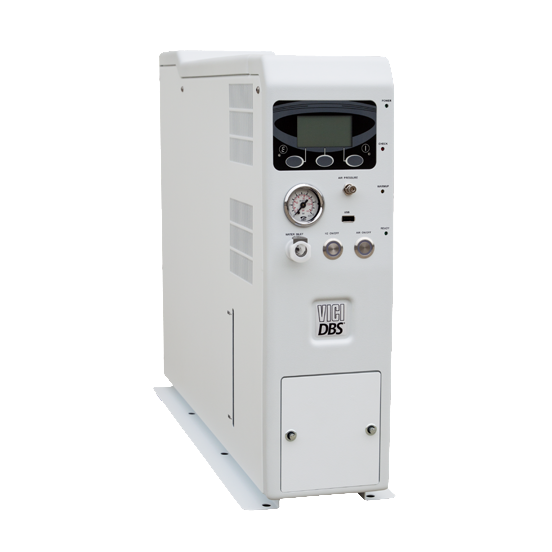 The VICI DBS Plus series also includes additional security features like a shock sensor to prompt shutdown in the event of an earthquake.